I ran into a man in recent years, educated and professionally accomplished, who didn’t like a lot of my observations and beliefs. They were too liberal and sometimes he’d laugh or scoff. It so happens that I believe in such things as a woman’s right to sovereignty over her body, a more just system of taxation, dignity of death legislation, universal health care, gay rights, the priority of green living through simplicity, alternative energy, recycling and vegetarianism. I voted the Green Party in the recent election. The last time we conversed, more than a year ago, he admitted to global warming, but thought of it as cyclic rather than human in origin. That’s ok with me, at least as far as a person’s right to a belief or opinion. However, I’ve often found a lack of fair exchange when it comes to beliefs like my own, perhaps because I live in conservative Kentucky or no longer have daily access to a university campus where my views often enjoy majority status and poetry is still admired. Perhaps views like mine simply make people feel uncomfortable with their resonance of gloom and doom, though I counter that acknowledging a problem begins its solution. But let me confine myself to global warming at the moment. I find the facts are in: It’s horribly real and its effects are happening universally and exponentially faster than many of our experts had projected. Our hurricanes occur more frequently and grow more menacing; floods and drought devour our landscape. In Europe, a prolonged heat wave this past year killed hundreds. Storms of the century are now decade-ravages, with Katrina and Sandy coming to mind. Meanwhile, the accelerating polar meltdown threatens methane release, a component that exceeds carbon as a dangerous contributor to global warming. Sea tides are rising and coastal cities like New York have begun drawing-up contingency plans. For another example of what’s going on, there is the current tragedy of bushfires in Tasmania, the result of prolonged drought, high temperatures, and persistent wind gusts. As I write, 65-homes have been lost, hundreds displaced, and 110 squared miles of land scorched. In its proximity to a warming Antarctica, Australia is fast taking on the prototype of our global future, compounded by the increasing impotency of our technology to cope. Southwest Australia, in particular, knows the scenario of diminished rainfall all too well. Famed for its vineyards abetted by rich soil and ample rainfall, the region has experienced a 15% drop-off in rainfall since 1975. Wheat, another regional staple, has been devastated, as seen in the current deluge of impoverished farmers. Meanwhile, the metropolis city of Perth has seen a 50% decline in its surface water supply since 1975. Sydney in eastern Australia, may face an even greater crisis if drought continues, despite having some of the world’s largest water reserves (Tim Flannery. The Weather Makers, pp. 127-129; 131). Climate change does, however, have its ardent critics, so my ethics demand fair play. In a recent Forbes article, Larry Bell, who comments frequently on climate and energy issues for the magazine, contends that “while most acknowledge that greenhouse warming may be a contributing factor, it is also true that a great many very informed scientists believe that any human contributions to that influence are negligible, undetectable and thereby grossly exaggerated by alarmists, while far more important climate drivers (both for warming and cooling) are virtually ignored. Particularly consequential among these are long-and short-term effects of ocean cycles along with changes in solar activity” (“Global Warming Alarmism”). Thank you, Larry, for just the right cough syrup for what ails us. You wrote your article on May 28, 2012, and say at the very beginning that “global temperatures have been pretty flat despite rising CO2 levels since the big 1998 El Niño ….”. Are you not aware that we can track resilient CO2 particles over the centuries and it demonstrates a rise from 645 gigatons (billion tons) of CO2 prior to the Industrial Revolution, or 1800, to our approximate 869 gigatons currently? I’m sufficiently aware that association doesn’t confer causality, but it should caution skeptics to reassess. By the way, half of our present annual CO2 derives from burning fossil fuels. God only knows the fate of our planet with world population continuing to rise and more coal-fire plants and more cars in the works. Critics needn’t belly ache about alarmists. They’ve got inertia on their side. It’s near impossible, for example, to get rid of plastic bags in our stores, given corporate interests and the abstract nature of a threat seen more theoretical and distant, and thus problematical, by many consumers. Besides, it’s just damn inconvenient to our comfort zone to change our ways. In a time of budget crisis, government is no help, deferring to present needs while defaulting on our children’s future, reminiscent of its widespread underfunding of pensions for future retirees. 2012 was the warmest year ever recorded in the U. S., and second only to 1998 in the agency’s “extreme” weather listing. It was also the driest year on record with an average rainfall of 26.57 inches, or 2.57 inches below normal. Wildfires destroyed more than 9.2 million acres, the third highest number in our history. 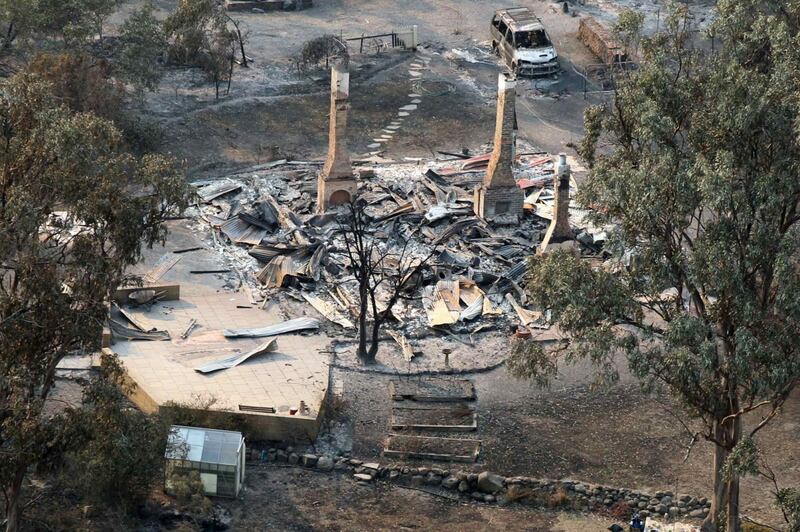 As I conclude my post, fire has also swept across large portions of New South Wales, where Sydney is located, destroying forests, pastures and flocks along with many homes. It’s summer down under, and like here, temperatures are at record highs. This entry was posted in Environment, Reflections and tagged climate change, environment, Global Warming, Tasmanian fires. Bookmark the permalink.